Organized is what we should be but mess is equally good. This is the day we once wished to live – our child’s toys spread all over the bed – and we should be thankful for it. Once you become a parent, you need to overlook the mess. Tiny feet trotting from one room to another, searching for naughtiness make us more patient each day. It’s so obvious why work never ends for mothers. My little one never misses a chance to keep me on my toes. But I love it when he enjoys the mess. I love to see the shine in his eyes. The naughtiness on his face while throwing things. His smiling face when he plays with my lipstick and smears his hands with one of them. His winning voice when he makes my box full of accessories, come tumbling down. Kids love to create clutter and we as parents learn to live with it as it helps them grow, makes them learn and explore. We learn to surrender to it. There is no method or particular way – Just Let them be Kids. They are pre-programmed for making a mess. 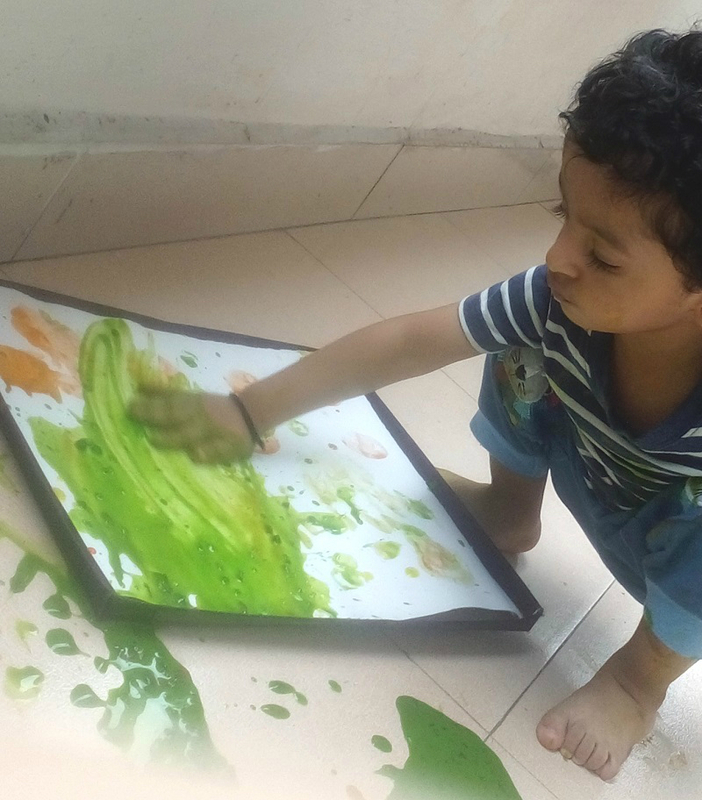 Messy play makes them feel free and independent; and this is what a kid wants. It soothes the nervous system and creates space for creativity. 1. I do not restrict him to 1 room or corner. I do not mind him tumbling down his toys basket in the living room. Sometimes, changing the playing space is all that he needs. 2. I do not rush to pack his toys right after he moves out of the room. It’s only when we are going out or before sleep. 3. I do not pack him in super cute clothes at home and allow him to smear his clothes with food or dirt. 4. I allow him to play with water- kids love it. I never mind the effort it requires to clean it up. My little one hates wearing bibs – he loves to spill. Earlier, I tried hard to use them but then I quit and always carry a pair of extra clothing. It’s better to see him smile rather than make a fuss. 5. He loves to explore every single cabinet within his reach every day and I love keeping the things back in their place. Earlier, I couldn’t even sleep if my bedsheet was crumbled but now being a mother, dozing off after a hectic day is what matters more. There is no specific play time for infants and toddlers. Even mealtime is play time for them. Moreover, if there is no mess, how can you teach them the habit of cleaning up and putting the mess back together is always fun. He is 2 and I ask him to collect his toys and put them into the basket. Though, he tumbles it again just to enjoy my frown with a naughty smile. Mess means you are not only living but loving it. 1. I give him some sketch pens (washable) and allow him to draw spirals with them on the floor/chart paper. 2. I allow him to jump in puddles. 3. I allow him to roll the dough while I cook. 4. I allow him to play with food – Intention is not to waste the food but 1 or 2 portions is OK.
5. I allow him to collect leaves, flowers, sticks and stones while he plays in the park or surroundings. 6. I take him for nature walk in the morning over the weekends. 7. I use the mirror and allow him to smear it with water or lotion. Nothing can replace the fun and learning of a childhood filled with messy play, we need to make sure that our children living in urban environments don’t miss out on this essential group of experiences.